Quetzaltenango preserves traces of the colonial period in its streets and avenues. Classical, neoclassical and Italian renaissance styles are evident in the buildings and many of the houses were built during the last century. Situated in the center of the town is The Central America Park, also known as “Parque Central”. 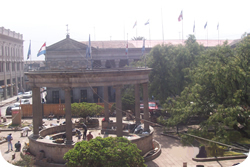 Around this park lie the cathedral, city hall, the main government building, and “Pasaje Enriquez.” The city has important cultural activities, and the first Sunday of each month there is an artisans´ market in the Central Park where handicrafts from Quetzaltenango and surrounding villages are displayed for sale.